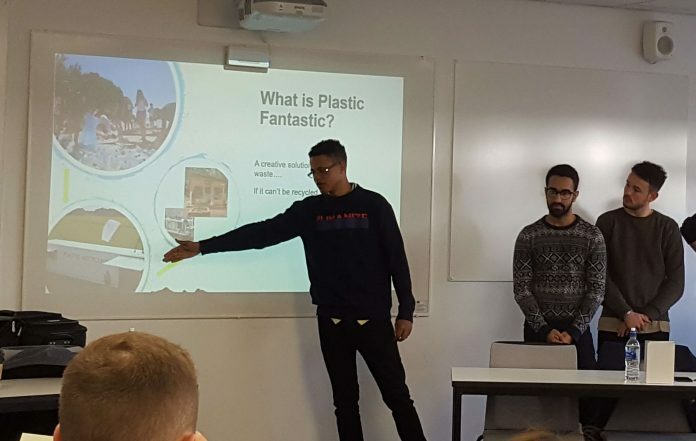 Students from the University of Derby are creating a new start-up business, which aims to tackle plastic pollution by collecting and recycling waste and transforming it into sustainable ‘green’ products for sale. Involving 12 students from the Colleges of Engineering and Business working collaboratively, the Plastic Fantastic project will see them convert waste collected on campus, such as plastic water bottles, into useable materials and products. After undertaking feasibility studies, final-year engineering students will build simple machines to convert the waste, using open source designs from Precious Plastic – a global community of people working towards a solution to plastic pollution. Business students will create business cases, marketing strategies and sales plans for the recycled products, to ensure the start-up can become a viable student-led company. The aim is to develop the business each year, with new students being ‘employed’ through their final-year projects to progress the business model, redesign the machines, maintain their parts, design new products and find new markets. The student projects are being led by John Thorley, Senior Lecturer in Mechanical Engineering, and Olivia Ramsbottom, Senior Lecturer in Business and Management. Dr Fred Paterson, who initiated the project and leads on Sustainable Business for the College of Business, said: “Plastic waste is usually seen as a blight and cost to our organisations and communities, but it can also be viewed as a valuable and under-used raw material. “This inspiring and impactful cross-college project will develop engineering and business skills for the emerging low carbon economy, while also addressing more general employability skills for the students involved.